Cars tend to be standard transmission, and one drives on the right hand side of the road. Traveling throughout the country is fairly simple since the highway systems are very basic; there are not usually more than two ways to get from one destination to another. Travel is made easier by the fact that gas stations are numerous and well-positioned on the highways and in the cities. The pedestrian is not a high priority in Senegal, which is a country of highly impatient drivers. It is thus important for a pedestrian to use special care when crossing. 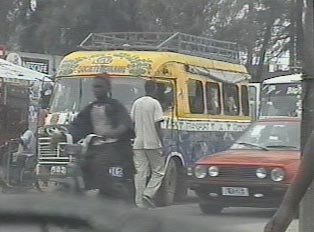 Luckily for those on foot, the traffic in Dakar is severe enough that, in addition to walk lights at intersections, there are usually enough openings in stalled traffic for anyone to cross fairly easily.However, given the duration of traffic jams, people tend to lose their patience, and it is not uncommon for a driver to simply pull up on the curb to pass. It is necessary for pedestrians to remain alert.